A sprig of faux cranberries and the Cranberry Cosmopolitan recipe (below) printed on card stock and tied with ribbon or raffia create a festive gift bottle! Bring the water to a boil in a saucepan. Stir in the sugar and simmer for about 1 hour or until the mixture thickens and becomes syrupy. Chill. Mix together the vodka, chilled syrup and extract. 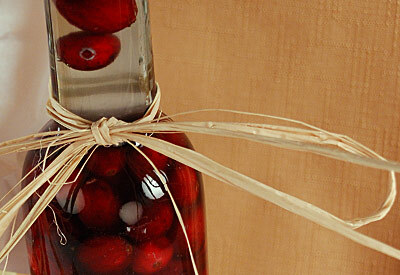 Drop cranberries into a long-necked bottle* and then add liquid. As the liqueur ages, the cranberries will add flavor and color. *Use smaller cranberries that will freely drop through the neck of the bottle without being forced, otherwise large cranberries will block the opening to the neck of the bottle blocking small berries from floating into the neck when the liquid is added. Make sure that the flavoring is water-soluble. Oil-based flavorings will not emulsify into the base. Mix with 1 cup crushed ice; strain into martini glass.